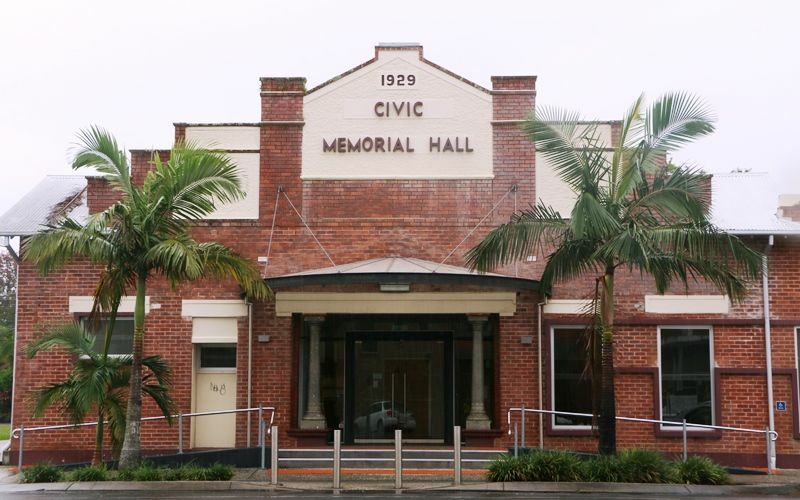 Civic Memorial Hall commemorates those from the Brunswick District who served in World War One. The hall was officially opened on Anzac Day 1930. The hall underwent a major refurbishment in 2008. Initial discussion about a suitable memorial began in 1919 and it wasn't until nine years later that construction began. Delays were caused by problems raising the necessary funds and debate about the most suitable form that the memorial should take. 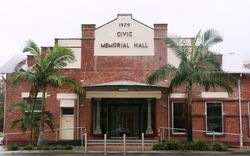 It was finally dedicated as a School of Arts Memorial Hall in November 1929 with funds coming from a combination of money raised by public subscription and money donated by the Local Council. Construction on the Hall began in 1928 and the hall was finished the following year in 1929. The Mullumbimby Memorial School of Arts was opened on Friday in glorious weather. Over five hundred people attended. A combined Anzac memorial service followed on the ceremony. Proceedings commenced with the forming up of returned soldiers and members of friendly societies at the railway gates, this body marching to the front of the new brick building in Dalley-street. The Mayor (Ald. A. W. Chew) said that the opening of such a public memorial as the School of Arts was in respect to fallen diggers and was something of which the surviving diggers were greatly pleased. He trusted that the School of Arts committee would get the full support warranted in their worthy object. He referred to the present national depression and said he hoped that the same spirit shown by the Anzacs would manifest itself in the solution of these present day problems. The Mayoress (Mrs. Chew) then, unveiled the memorial tablet and pillars. Many wreaths were placed around the pillars. Mr. A. E. Budd, M.L.A., said that the president, secretary and committee had worked hard towards the consummation of the building, and, he congratulated them on the result of their labour. Disaster had befallen the School of Arts in the loss by fire of their old building, but Phoenix-like from the ashes had come this structure. The School of Arts stood for the education of the people of the town and district; it was a means of the extension of the education received at schools. He stressed the importance of a debating society connected with the School of Arts and recommended its utility to the committee. The building stood as a lasting memorial of the heroism and valour of the boys who went overseas for all they held dear, upholding and cementing together the Empire. While they rejoiced in the achievements of these men, they remembered the boys who did not return falling for the ideals for which they fought. Northern Star (Lismore, NSW), 29 April 1930.